Note that I use 12-month trailing earnings, with a two month delay on price data (since it takes some time before earnings are released to the market). 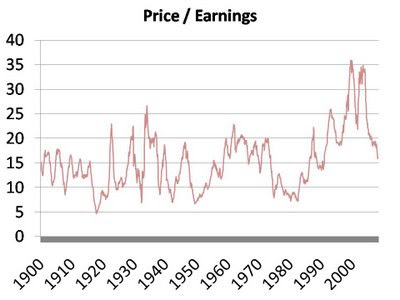 The average P/E over this time period is 15, but note that we are very rarely actually at the average! But we are close to that average right now. It's interesting to note various bull and bear markets throughout the past. We see the most irrational bout of exuberance taking place in the late 90s and early 2000s. We also see the bear market of the 70s when inflation was high and pessimism was rampant. Stocks were trading at P/E multiples well below 10. This looks like a dream come true for value investors. But it's not just in the 70s where we see compressed P/E values. For those who are patient, we can see that the market rewarded them many times with large dips in P/E, rewarding those who carried cash into those periods. Although the S&P 500 has been below 10 seven times since 1900 (and stayed there for a while on several of those occasions), it hasn't happened since the early 80s. With inflation on its way up, might we be headed back there? 1. Sustainability of Earnings: ROEs and share of corporate earnings of GDP were at historical highs the last years. Part of it is sustainable (intangibles), but some of it was based on leverage in the financial sector. 2. Net Cash: At the same time, some non financial sectors (tech, pharma) have huge net cash positions after taking advantage of the good years. Like Munger says: "Cash on the balance sheets or corporates has never been higher. If they all bought back there stock their P/Es would be trading at a 50% discount to the historical market average." It would be nice if those of these factors were incorporated and have some clarity by sector. I thing Vitaliy from Contrarian Edge has done some analysis by sector. taking into account the cash on hand only matters if they do something good with it. If it ends up in Executive pay or botched investments, then it was worthless.